A: Machine Wash Warm. Do Not Bleach. Cool Tumble Dry or Hang. Remove Promptly. Use only Non-Ionic Detergents and Softeners. Modern commercial detergents contain enzymes, bleaches, surfactants, and builders. The surfactants found in department store detergents include anionic (negatively charged) chemicals: alkyl sulfates, alkyl ethoxylate sulfates, and soaps in the ingredient list of your detergent. These are used to remove oily dirt and stains. However, these can strip ESD Garments of their positive ions leaving it predisposed to carrying negative charges. This will ensure the garments do not meet their 100 washes rating. If you are using detergents or fabric softeners, you need to ensure you are using only non-ionic surfactants. Non-Ionic surfactants have no electrical charge. Chlorine bleach attacks carbon bonds which in turn destroys this black carbon threading. Non-chlorine bleaches are those used in “color-safe” commercial bleaches that are activated by contact with oxygen in the water. These are known as oxidizing bleaches: hydrogen peroxide, sodium percarbonate, and sodium perborate. While not as destructive to the carbon threading as chlorine bleach they are alkalines that can remove carbon with repeated use. Whenever you clean an ESD smock in a washing machine, you are degrading the quality of it. If you are using an “industrial washing service” it may only last one wash. 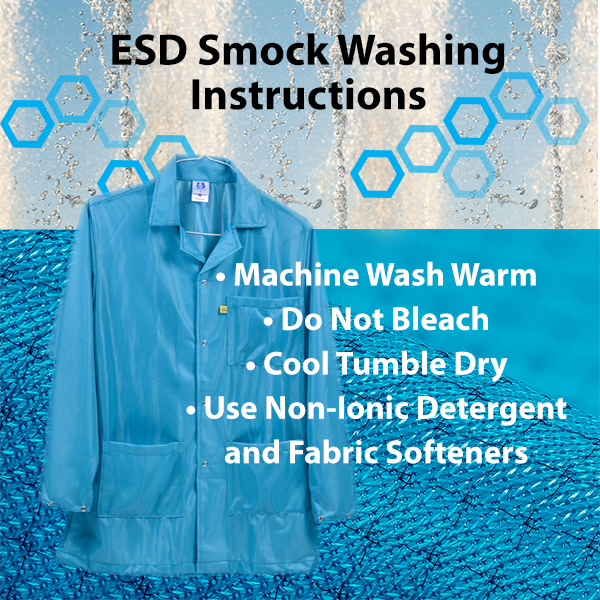 Most ANSI / ESD S20.20 certified smocks can be washed only 90 – 100 times using non-ionic detergents before you need to buy a new one.